Usage: open Seafood,such as oysters,scallop. 5 X Oyster Knife. Product size: full length 145mm/5.71" knife edge 58mm/2.28". Material: stainless steel PP. I am happy to service you. Due to the different monitor and light effect, the actual color of the item might be slightly different from the color showed on the pictures. Vintage R. Murphy Ayer Mass. Clam Shucker Shucking Opener Knife 6.25" Blade 2.5"
Clam Shucker Shucking Opener Knife 6.25" Blade 2.5". Sold as is. PAKKA WOOD HANDLE WITH HAND-GUARD - We know how important handle design when choosing oyster knives. MIRROR FINISH FORGED STAINLESS STEEL BLADE - Using only the best 420-stainless steel, this artisan made oyster knife features a “full tang” mirror finish blade that is securely held together with 3 strong rivets that have been compression riveted to the beautiful pakka wood handle. Vintage Oyster Knife! Ekco Housewares Inc! (1988) Unique old hard to find Item! Vintage Oyster Knife! Ekco Housewares Inc! (1988) Rust Free Stainless Steel! Sturdy Hardwood Handle! With Instructions! Unique old hard to find Item! Thanks for looking 😀! 100 % Satisfaction Guaranteed! Makes shucking and shelling easy. Ergonomically designed to fit perfectly for left or right hand users with an oversized handle and finger indents to give a great hold without strain. Ergonomic, supergrip handle slip resistant even when wet. COMBINING AGE OLD TRADITIONS WITH. Dishwasher safe - NSF approved. High carbon steel blade. Where are Victorinox knives made?. All Victorinox stamped Blades are manufactured in Switzerland. What are the different edges and what do they do?. It will cut perfectly and without tearing or shredding. We greatly appreciate. We will reply you ASAP. We will do our best to solve your problem as soon as possible. A clam knife is designed to efficiently pry open and remove the muscle from a clam. It is important that a clam knife is not confused for an oyster knife. A clam knife has a rounded tip which can be used for scooping and two different edges on the blade. Pair with our Cut-proof Shucking Cloth for the ultimate oyster shucking setup. Every product sold replants 10 square feet of new oyster habitat helping to clean our coastal waters. Put 'Em Back. The most ergonomic oyster knife on the market. Clean the oysters before shucking. STEP3: Run the blade under the oyster to detach the muscle. 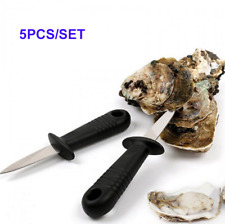 2pcs black oyster knifes. Enjoy with hot sauce or lemon juice. STEP2: Run knife along edge of shell to separate. LEIFHEIT PROLINE PLUS Oyster Knife. Stainless Steel Blade. Non-slip Soft-grip Ergonomic Handle. Offering for sale this great Hurricane clam / oyster knife with stainless steel blade measuring 3 inches in length. In new condition still in the package and ready to ship. Please ask any questions and I'll get right back to you. Thanks for looking, and good luck! John B Outdoors looks forward to serving you. Check-Out Now! Sani-safe, stain free, high carbon steel, with white polypropylene handles. What happens after I have paid for my item?. We are located in Stuart Florida. From Mundial's Hercules line of products. Oyster knife with high-carbon no-stain blade and antimicrobial plastic handle. NSF listed; made in Brazil. PAKKA WOOD HANDLE WITH HAND-GUARD - We know how important handle design is in an oyster knife. Our oyster knife is equipped with a short, rigid blade that efficiently pries open the oyster shells and severs the muscle hinge, making it easy to enjoy the plump, juicy oyster within. This wooden handle makes a beautiful presentation while the narrow, beveled edge makes popping clusters a charm. Item for Sale: Chroma type 301: Oyster Knife. The handle of the Type 301 by F.A. Porsche is constructed of 18/10 stainless steel, and the blade is made of high-quality Japanese 301 steel. The blade of each knife is carefully sharpened by the hand of a master. Oyster knife with guard and sturdy blade, 6-1/4" overall length Please note, customs and duty taxes are the responsibility of the consignee and are not included in the shipping cost. PRODUCT NUMBER S126. Shucking oysters are much more pleasurable when you use an oyster knife with the right features. Make easy work of oyster shucking by using what the pros use. Sani-Safe handles feature a textured, slip-resistant, easy to clean polypropylene handle that withstands high and low temperatures. OXO stainless Oyster Knife about 8" long. A bent tip makes prying open oyster shells easier. 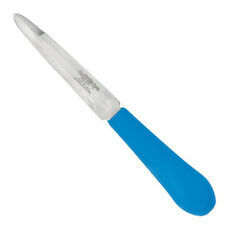 Nantucket Seafood Oyster Knife the ideal tool for opening oysters. Its short, blunt Stainless Steel blade is perfect for prying open shells. It will help make quick work of opening oysters so you can get to the joy of eating them sooner. The Largest Manufacturer of Professional Cutlery in The United States. Professional cutlery designed, built, and tested to be people friendly and kitchen tough. Knives are sharp, right out of the box. Model # 44693. • Red SureGrip Handle. In 1897 the Original Swiss Army Knife was created in the small village of Ibach, Switzerland. Victorinox 2 3/4" New Haven Style Oy ster Knife. We also carry a full line of original Victorinox Swiss Army Accessories Including Cutlery Edge Guards! A textured, slip resistant, easy to clean polypropylene handle withstands both high and low temperatures. An impervious blade to handle seal provides the utmost in sanitary performance. Handle sealed around blade to make knife easy to keep clean. A textured, slip-resistant, easy-to-clean polypropylene handle withstands both high and low temperatures. An impervious blade-to-handle seal provides the utmost in sanitary performance. Made in USA. HEAVY DUTY OYSTER KNIFE 2 OF THEM WITH OYSTER GLOVES. GIFT AT YOUR NEXT OYSTER ROAST. THIS IS FOR 2 KNIVES AND 2 PAIR OF GLOVES. BLADE IS 3-3/4" LONG. Oyster knife. 3 in blade length. Blade is hand honed for superior edge. Health & Safety Supplies. High-carbon steel construction. Under no circumstances can we take back an item that has been used. Tundra was started in Boulder, Colorado in 1993 – over 20 years ago. Shucking oysters are much more pleasurable when you use an oyster knife with the right features. Make easy work of oyster shucking by using what the pros use. Sani-Safe handles feature a textured, slip-resistant, easy to clean polypropylene handle that withstands high and low temperatures. 2 Murphy Seattle Shuckers. 420HC High Carbon Stainless Steel Maple Handle. Blade: 2-1/2" L x 3/8" W.Stainless Steel Blades: Hand wash and dry knives. Do not put knives in dishwasher. VICTORINOX OYSTER Knife Boston Style 4" Regular SuperGrip Handle 44696 NEW! Red SUPERGRIP Handle. OYSTER KNIFE. 4" GALVESTON STYLE OYSTER KNIFE. Zyliss Oyster Knife The Zyliss Oyster Knife consists of a sharp curved blade and serrated edge to break through even the toughest oyster and muscles to release them from their shells. With a finger guard on the knife, every care has been taken to ensure a good, safe grip for opening your favorite clammed delicacy. Serrated edge and curved tip detach oyster from shell Non-slip handle with protective guard Dishwasher safe Please note, customs and duty taxes are the responsibility of the consignee and are not included in the shipping cost. Murphy shellfish knives are the recognized leaders in the industry. Made with the finest cutlery steel, the blades are uniformly hardened and taper ground. Stainless steel blade. Large steel ferrule, long easy-grip handle. PRODUCT NUMBER S134. Shucking oysters are much more pleasurable when you use an oyster knife with the right features. Make easy work of oyster shucking by using what the pros use. Sani-Safe handles feature a textured, slip-resistant, easy to clean polypropylene handle that withstands high and low temperatures.